Body massages are a very beneficial spa treatment that can help you relax, rid you of ache and pain, and aid in many other health benefits. There are many benefits of massage and many types of massage which can allow you to target different problem areas. At Belle Ross Spa & Salon in Southaven, we offer a variety of massage styles that can provide you with the benefits you are looking for. This massage style is done by rubbing the muscles using long smooth strokes in the direction that the blood flows to the heart. A Swedish massage also uses circular pressure, kneading, percussion-like tapping, stretching, and bending as other techniques. A therapeutic massage is a massage that helps with pain relief, stress reduction, and works specific areas. This is a general term for a variety of massages. Some therapeutic massage styles include trigger point, sports, and myofascial massage. These massages use a variety of techniques to provide your body with what it needs, whether it is a deep tissue massage technique or a lighter touch. A deep tissue massage uses firm pressure and slow strokes. This technique helps to target deeper layers of muscle and fascia. 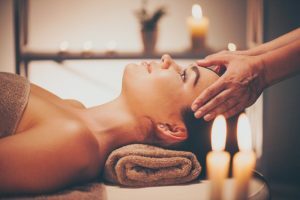 Unlike a therapeutic massage, this massage type will always use this technique rather than be altered based on your needs. This may not be the most relaxing massage type but it does offer a ton of benefits. A prenatal massage can help with the discomforts of pregnancy and offer many other benefits. This massage type can help reduce the stress put on different joints due to the extra weight that pregnancy brings. During a prenatal massage, you can either be positioned in a seated massage chair, on your back (for later in the pregnancy) or in a sideline position with cushions for support and comfort. Different techniques can be used during your prenatal massage, including reflexology, Swedish massage technique, and more. Reflexology is a type of bodywork in which pressure is applied to hands and feet to help relieve pain and offer other benefits. The thought behind reflexology is that there are specific reflex points in the hands and feet that are connected to specific organs and other body parts. This energetic connection and applied pressure can help to provide different areas of your body with benefits. Scalp therapy massage is meant to help relax the mind and boost circulation. This is a great stress reducer since tension often builds in the head and neck. Warm oil is used as the scalp is massaged. An aromatherapy massage is often done with the techniques of a Swedish massage and essential oils. Different essential oils can help offer different benefits, such a stress relief, energizing, decongesting, and more. You can choose the essential oil you want based on the benefit you are looking for. The benefits depend on the oil you choose, but you will also experience the same benefits as the Swedish massage. To schedule your massage at Belle Ross Spa & Salon, contact us today!